Are you exhausted from trying to live your best, most perfect life? Then maybe it’s time to embrace the Japanese concept of wabi-sabi. So what exactly is wabi-sabi, and how can you apply it to your life at home? Here are some practical tips. Wabi-sabi is a concept that originated with Zen Buddhism in Japan. It is the celebration of everything in life that is imperfect. It is an idea that embraces flaws, blemishes, and natural objects. Wabi-sabi acknowledges that everything in life changes and grows older, always in a state of flux. If you’re tired of trying to maintain the illusion of having the perfect home all the time, then wabi-sabi is definitely for you. Forget about trying to make your home look like the latest West Elm catalog. Instead, focus on filling your home with objects that you love, whether they’re considered trendy or not. Don’t be afraid to shop at garage sales, flea markets, and thrift stores to find weathered items that tell a story. Try to look at things with different eyes. Instead of looking for the shiniest, newest object, start looking for the beauty in objects that have a history. It’s not imperative that all your dishes match, or all the furniture in your bedroom. In fact, in can be far more visually interesting if they don’t. Wabi-sabi celebrates character, and nothing builds more character in your home than a collection of mismatched furniture and décor. It’s much more important that you love each of the items than it is that they all match each other. Part of the beauty of wabi-sabi is its simplicity and elegance. Keeping your home décor simple allows more space for you to appreciate the objects you have. It also gives you more time to relax, since you aren’t constantly cleaning and organizing. Who couldn’t use a little more down time in their lives? There is no better teacher of the ways of wabi-sabi than Mother Nature. The natural world is constantly changing and there is beauty in aging and decay. That beautiful tree that you love in the springtime when the leaves first begin to bud is the same tree you love in autumn when the leaves change color and drop to the ground. Bring some of this energy into your home with plants and flower arrangements. 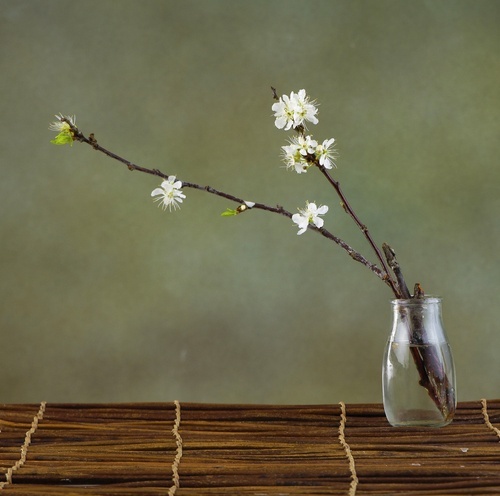 Branches make excellent centerpieces arranged in an earthenware vase. Don’t worry about getting too fussy with your styling – that’s a big part of the beauty of wabi-sabi. Who wants to iron their pillowcases? OK – maybe there are some people out there who find it relaxing. But if you’re like most people, it’s not a chore that is cherished. Don’t be afraid to live with your wrinkles. Wrinkled bedding or curtains are perfectly acceptable. There’s no need to try to make it look like nobody lives in your house or uses your things. Wrinkles are a part of life.